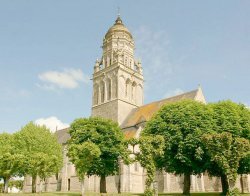 Sainte Marie Du Mont, as depicted in the television series Band of Brothers, was the first village to be liberated in Normandy during the D-Day invasion in 1944. Situated between Utah Beach and Carentan, this village was occupied by German forces who were manning various gun batteries in the surrounding areas as well as the bunkers on Utah Beach. During the early hours of June 6th, American paratroopers dropped in behind enemy lines in and around the village, with the objective of securing key targets prior to the allied beach landings. 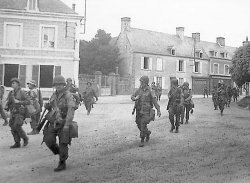 Although elements of the 501st and 506th Airborne were scattered all over the area after the parachute drop, General Taylor regrouped the men and took the Germans by surprise. The village was under allied control in the later that afternoon. Throughout the village, there are wall plaques that describe the events of that fateful day. Around every corner, there is a story that depicts the heroics of those brave men of the Airborne Divisions. One of the distinguishing features is the tower of the church. This magnificent structure almost seems out of place for such a little village. The bell tower was utilised by the Germans during the war as an observation point. On a clear day, it is possible to see as far as the Bay of Veys. For fans of Band of Brothers, you will remember in the second episode, “The Day of Day’s”, Richard Winters mentioning this famous part of France. In the final scenes of this episode, soldiers from Easy Company are eating and resting in the back of trucks. Winters looks out and views the allied and German battles raging in the distance and declares: “at the end of the war, I will find a piece of land and live the rest of my life in peace”. Tourism in this area is huge and it continues to attract thousands of tourists each year who want to follow in the footsteps of the Airborne troops.